This book will be available on the 22nd March Following our evening with Sarah Hilary in the bookshop. 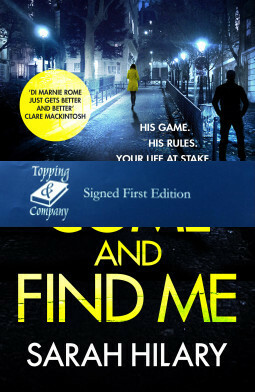 Gripping, twisting and full of emotional insight, Come and Find Me is Sarah Hilary’s fifth Marnie Rome book. Come and Find Me deals with obsessive and addictive love, sadistic and dangerous men, and guilt. A deliciously intense and addictive read.